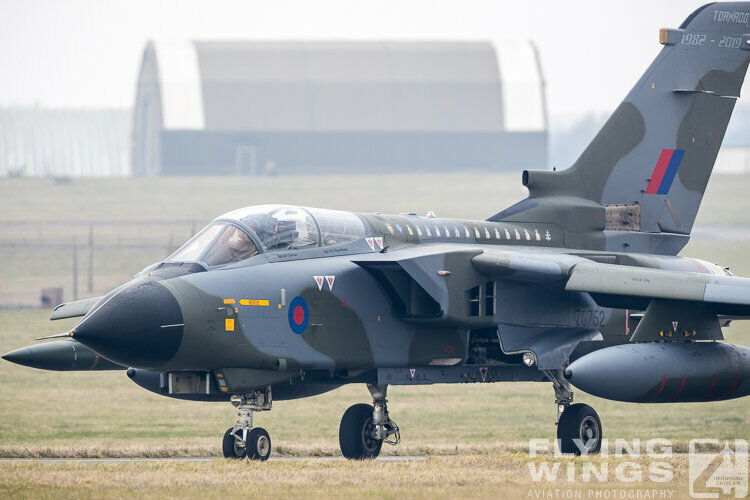 The first Tornados GR1 entered service with the RAF four decades ago in 1979 and was assigned to frontline Squadrons in 1982. 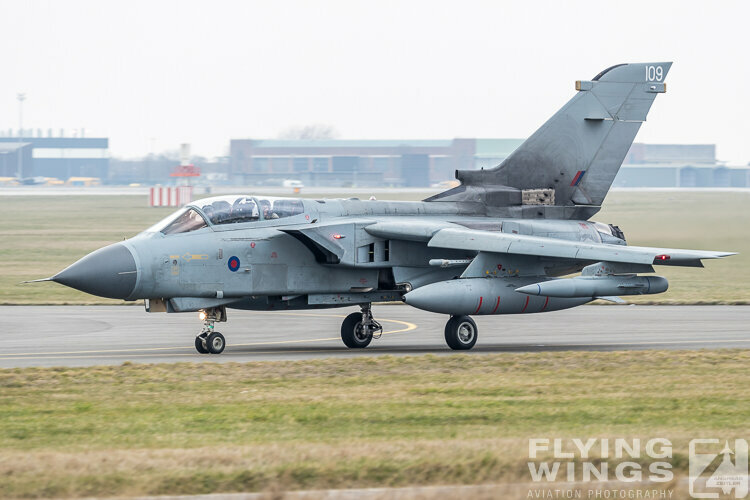 A total of 230 Tornados in the Ground attack and Reconnaissance version (GR1) was used by the RAF, out of them 142 were upgraded to the GR4 version. 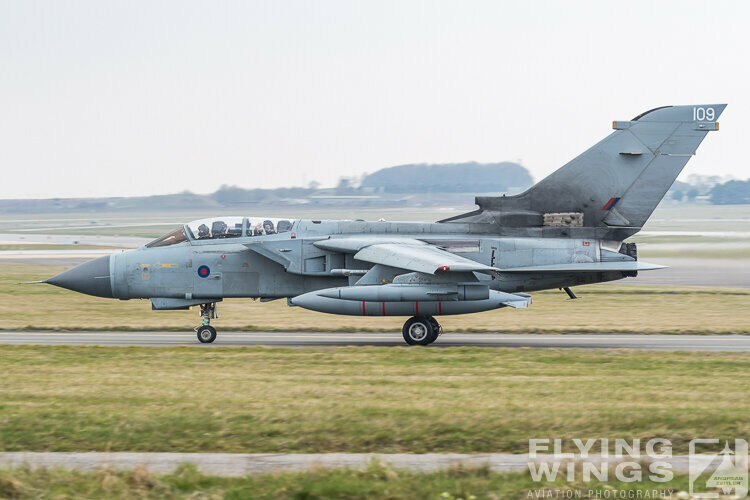 From the first live operations during the Gulf War in 1991, RAF Tornados were on deployment nearly non-stop until their recent retirement. The return from of Operation SHADER on 31 January 2019 concluded that long history that spanned the conflicts over the skies of Kosovo, Afghanistan, Iraq and Syria. 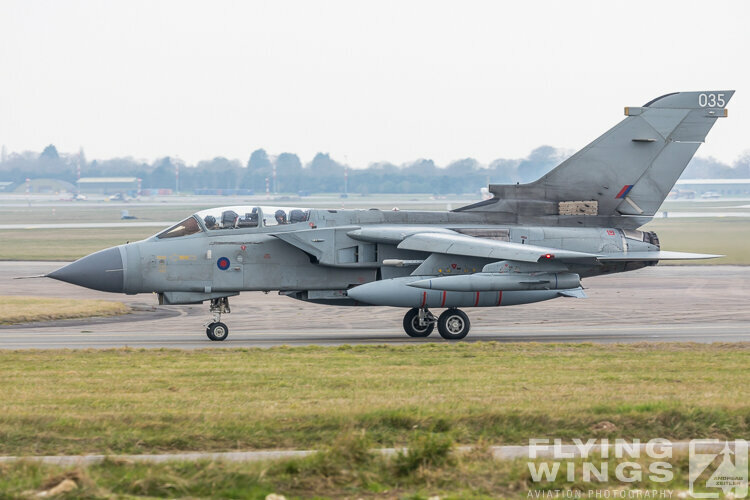 The Tornado will be withdrawn from RAF service on 31st March 2019, but the big diamond nine formation to honor and say farewell to the Panavia Tornado GR4 in RAF service was scheduled for 28th February. 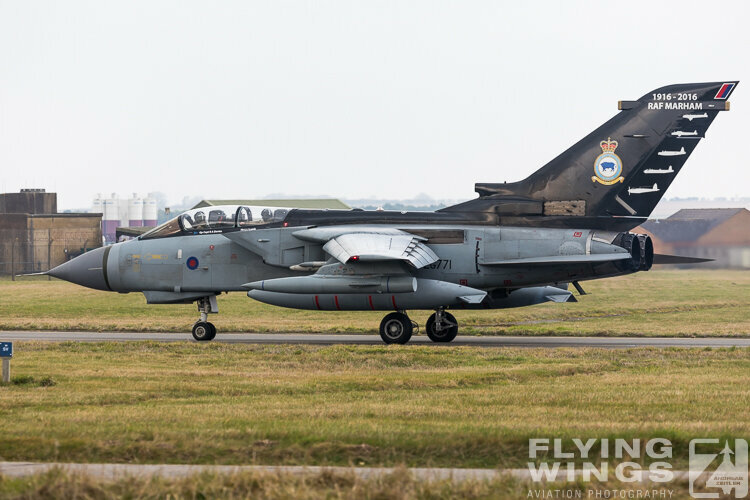 Nicknamed „the Fin“ due to its large tail fin, or „Tonka“ by the RAF personnel, this remarkable swing-wing jet gained gained a special place in the heart of British aircraft enthusiasts. 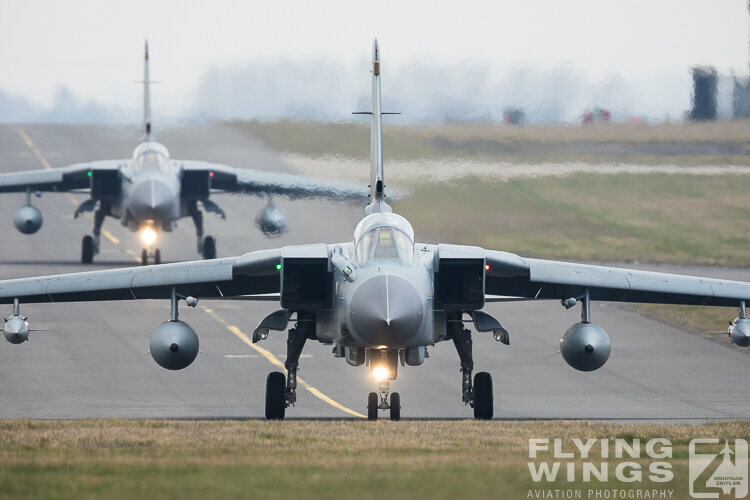 It was therefore no wonder that the field along the taxiway filled up quickly with cars that day. 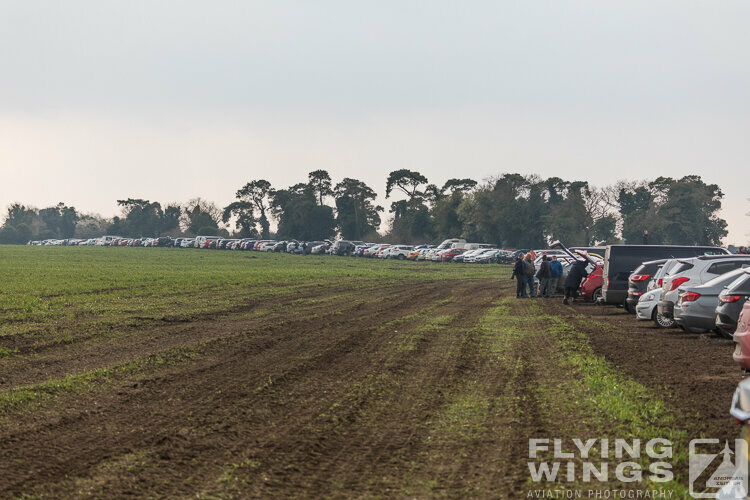 Two long lines with a total of maybe about 300 cars were already full before 9am, even though the take-off of the formation has only been announced for 2pm in the afternoon. 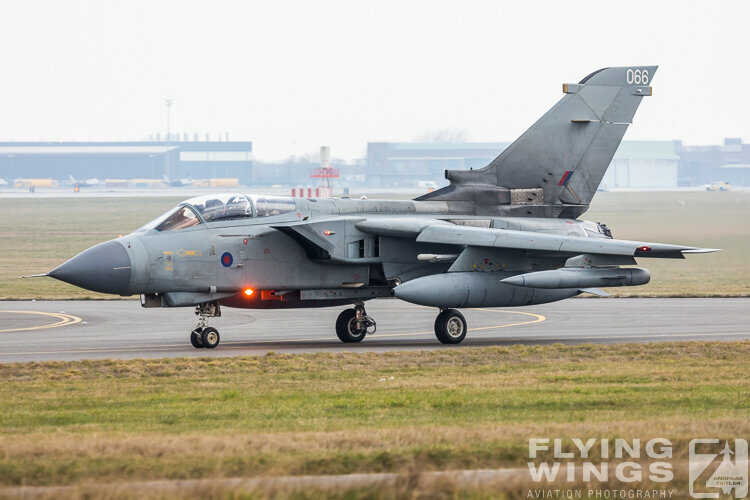 The sun was still out at that early morning time, the wind from the South was rather chilly, and a lot of time could be spend remembering and chatting about the good old days of the RAF Tornado Force. 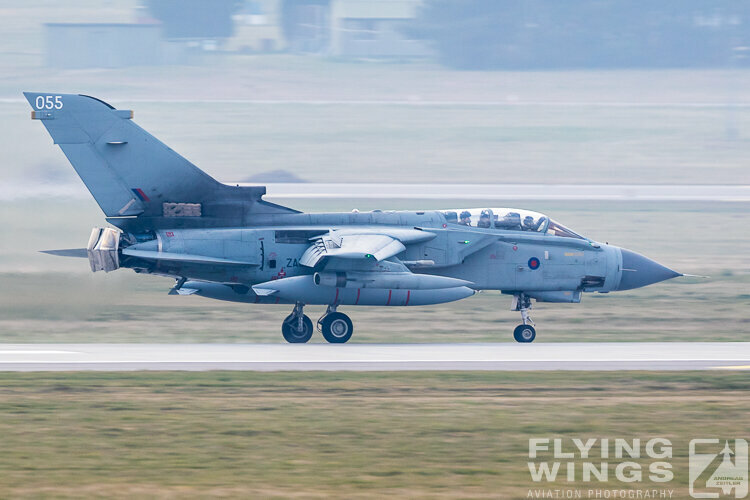 Also a sole Tornado was being towed to the other side of the airfield. 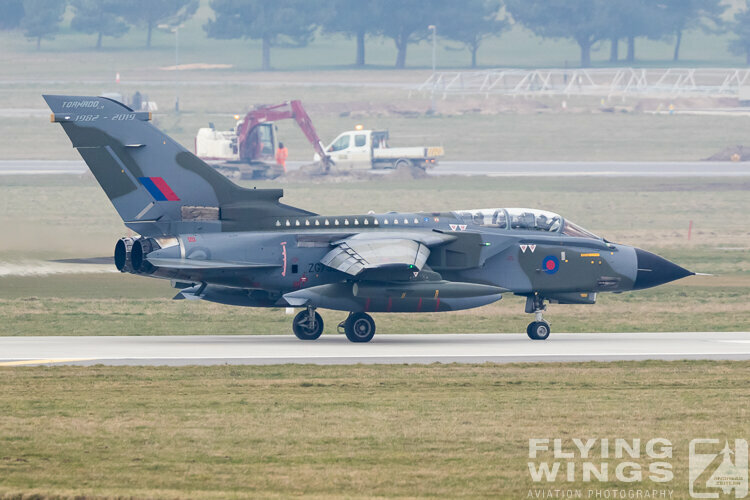 With its canopy and engines missing it was most likely taken to be scrapped. 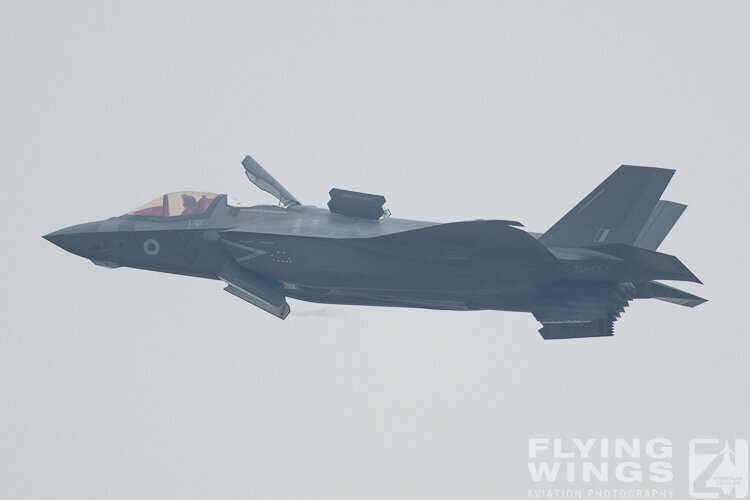 Later in the morning the successor of the Tornado in the RAF, the F-35B could be seen in the air and this shortened the waiting time a bit. 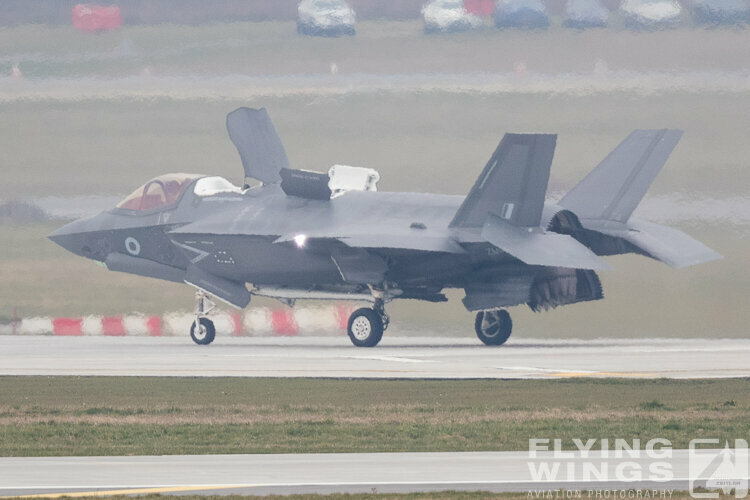 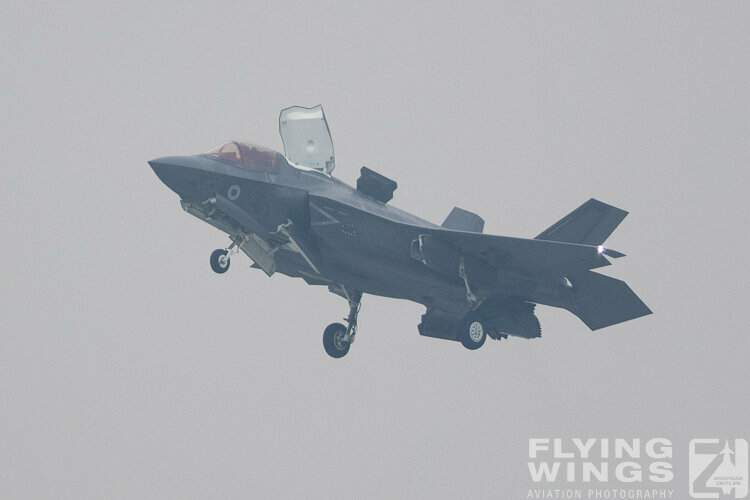 Two F-35B were on a training mission and the V/STOL-version of the JSF could be seen performing short take-offs and a vertical landing. 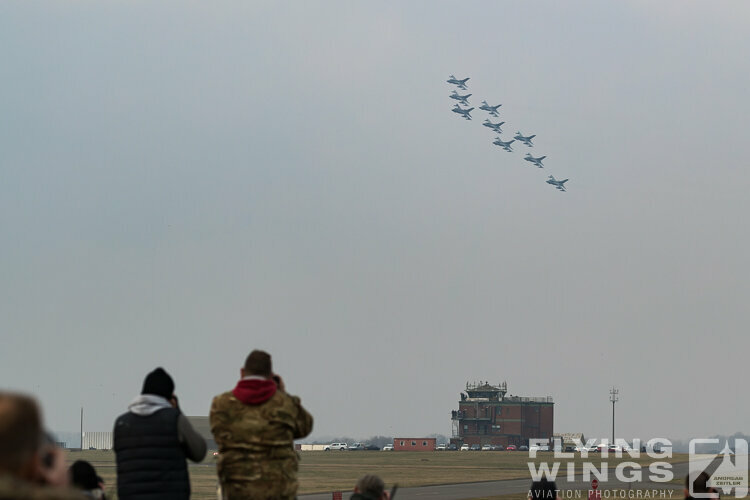 As a very nice gesture the Station Commander “Cab” Townsend also paid the waiting enthusiasts a visit and RAF Marham‘s media office distributed some souvenir photos that have been taken during an air-air photoflight of the three-ship formation of the special coloured jets. 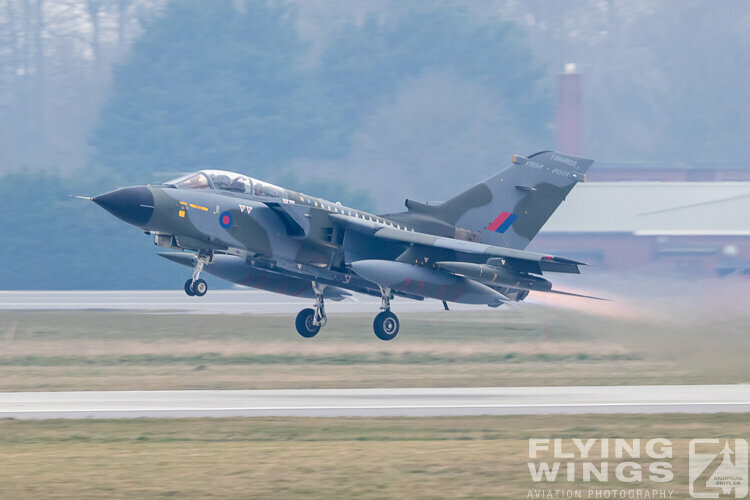 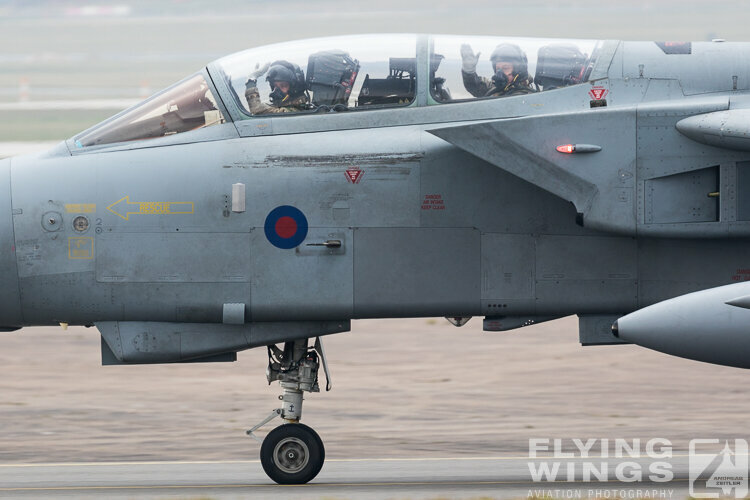 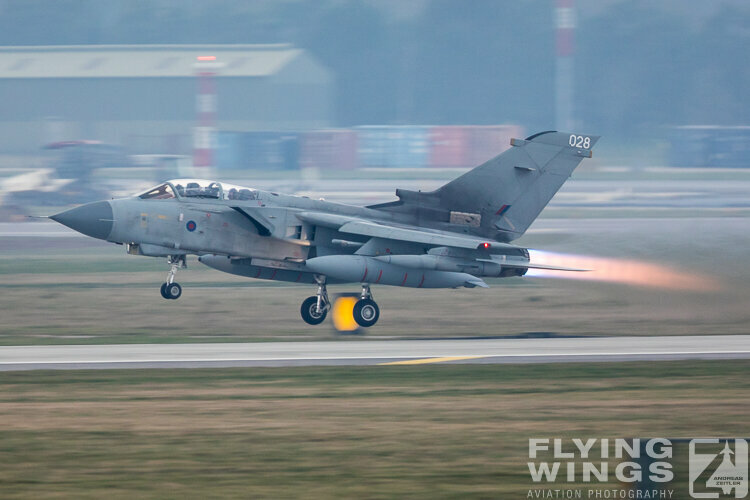 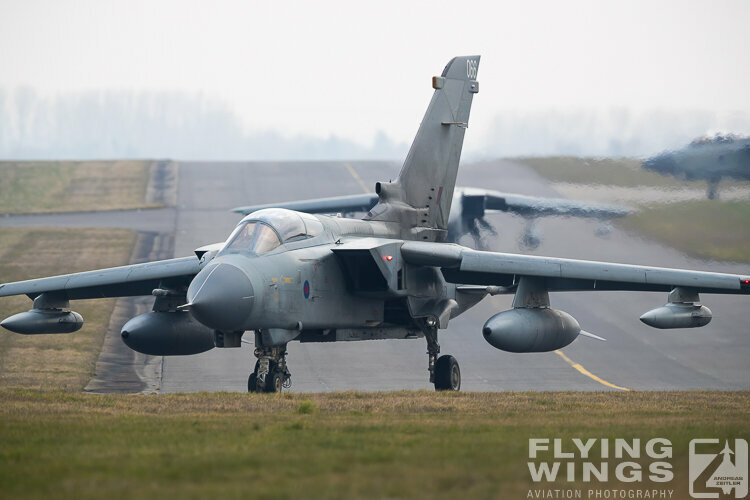 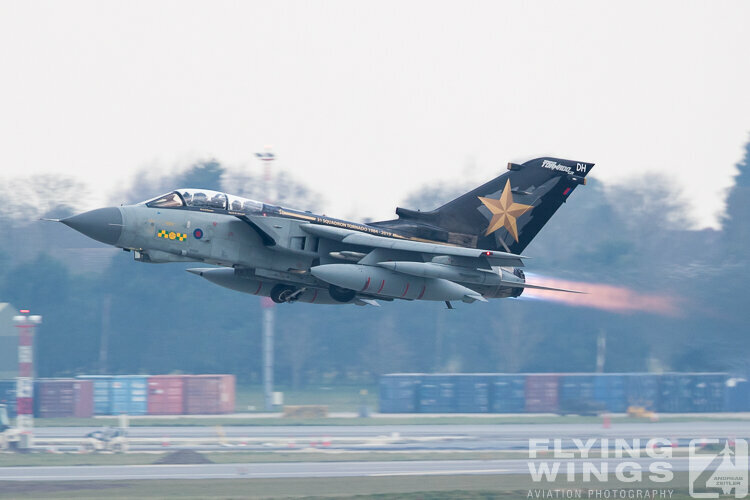 The main farewell scheme of RAF Marham has been a tribute to the Tornado‘s first camouflage in RAF service, the distinctive dark green and dark grey scheme that was optimized for low flying missions over central and Eastern Europe. 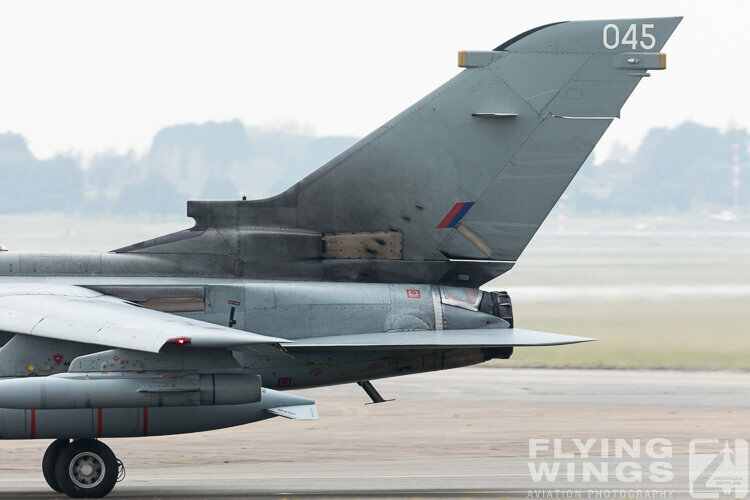 This jet also wore all of the former Tornado Squadron emblems on its spine. 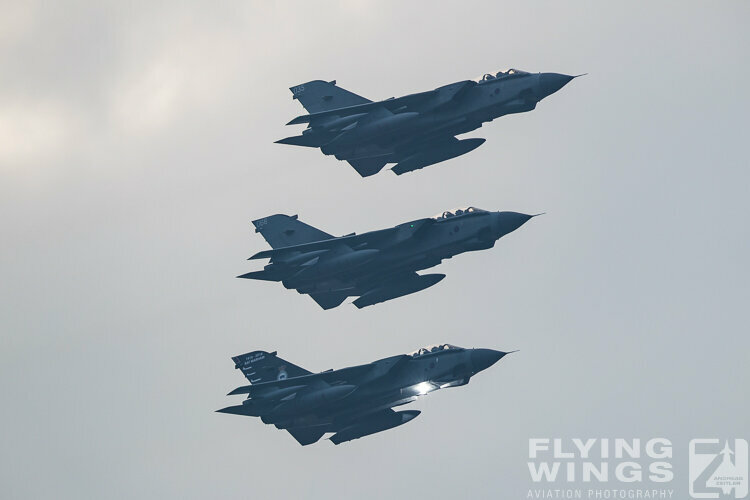 During the Gulf War, the scheme changed temporarily to the famous „desert pink“ and later one to a rather boring overall grey scheme, which was optimized for flying at higher altitudes over Afghanistan. 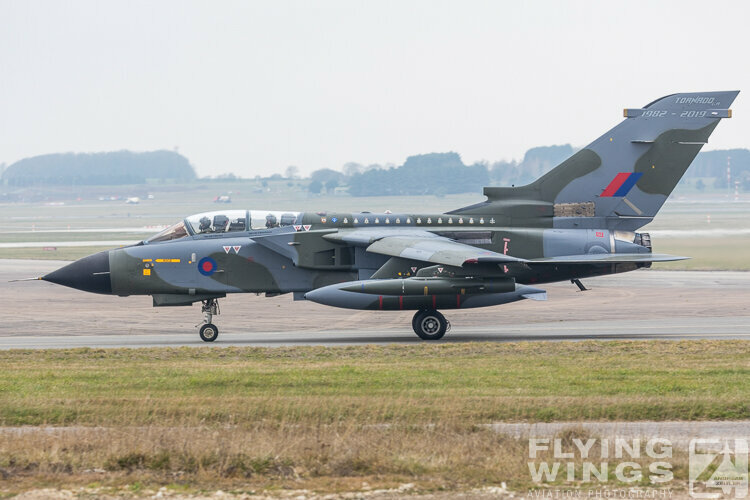 The other two special schemes that participated in the formation were painted to honor one of the final two Tornado Squadrons, No 31 Squadrons „Goldstars“ and 100 years of RAF Marham (1916-2016). 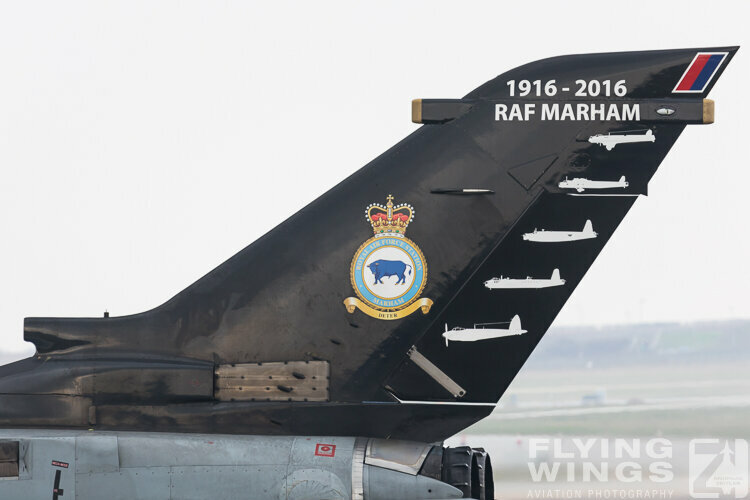 Unfortunately the special commemorative painting of No. 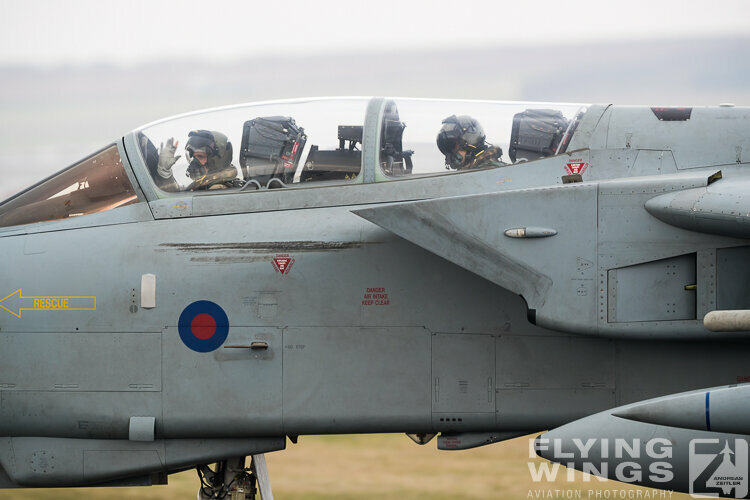 IX (B) Squadron was not seen that day. 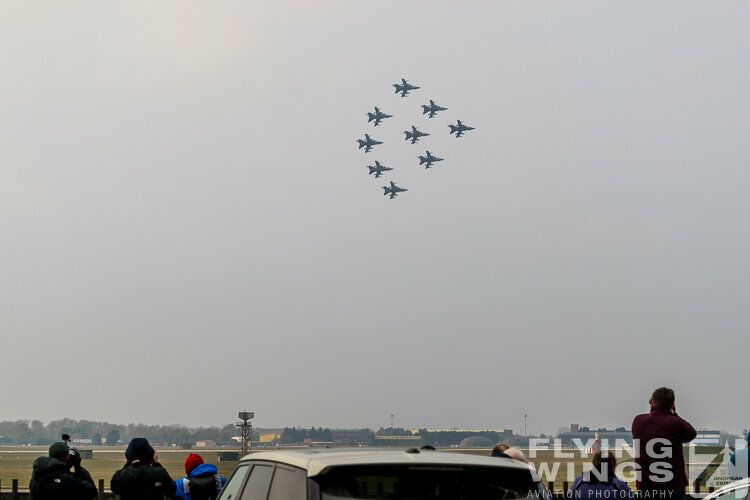 For the actual formation it was rather impressive to see eleven jets taking off. 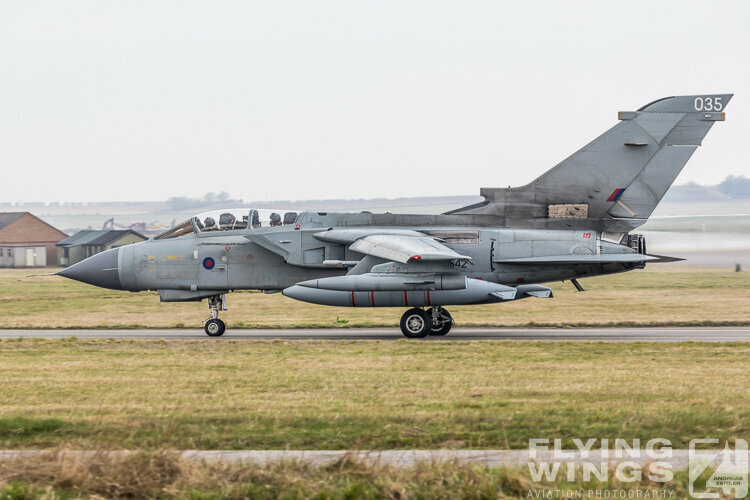 This can be considered being an outstanding effort regarding the fact that only 15 Tornados remained airworthy at that time. 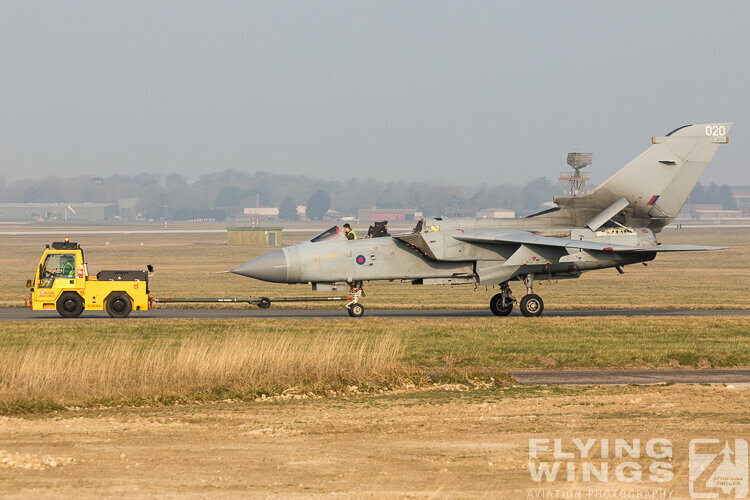 Crews were waving friendly as they taxied by in their jets and this was well returned by the photographers. 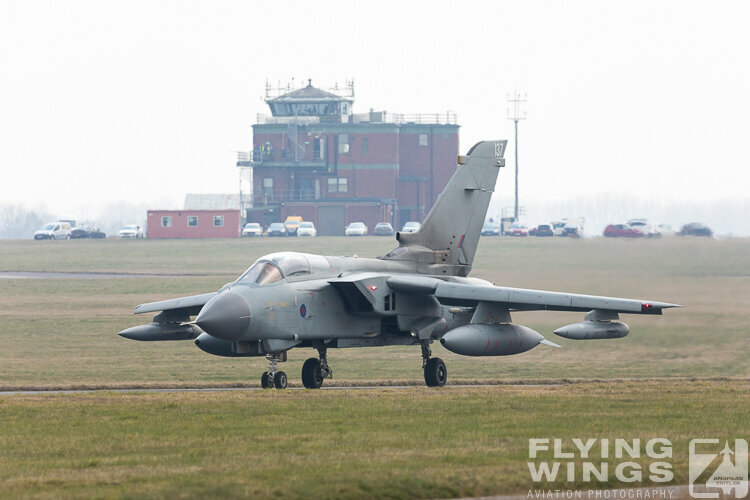 Unfortunately the take-offs on runway 19 were very distant and the air was really hazy. 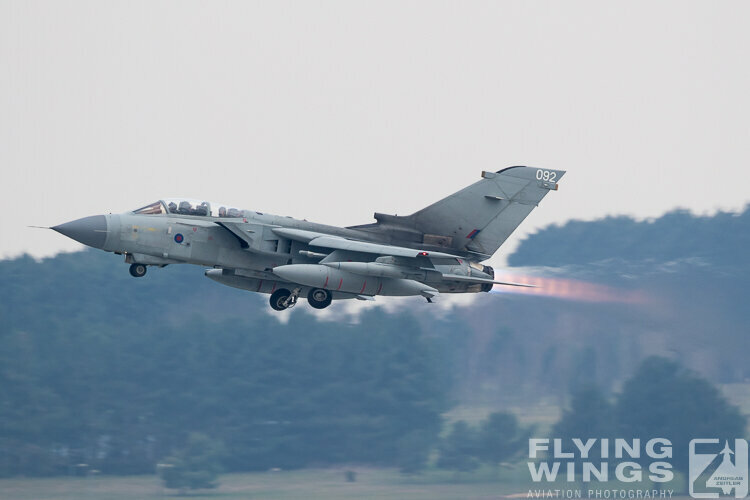 Nevertheless it was cool to witness all those jets taking off one after the other and the Tornado‘s distinctive afterburner was very well visible under these otherwise unfavorable conditions. 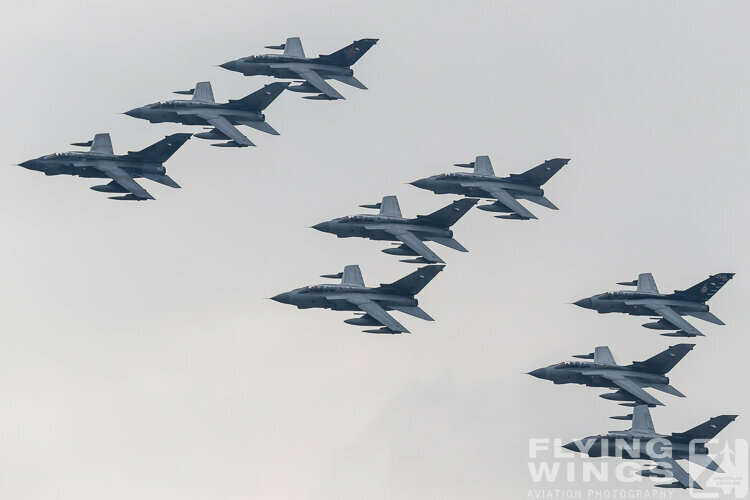 The formation itself was really something special. 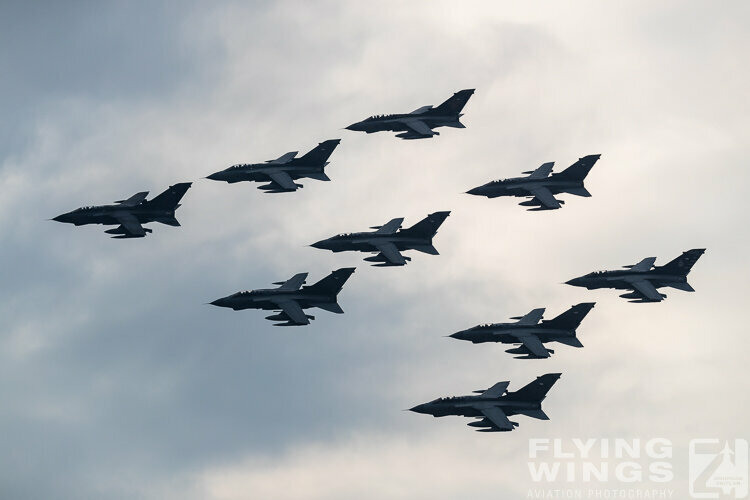 Nine GR4 Tornados with their wings swept to 25° flying overhead in a close diamond nine formation was a sight to behold! 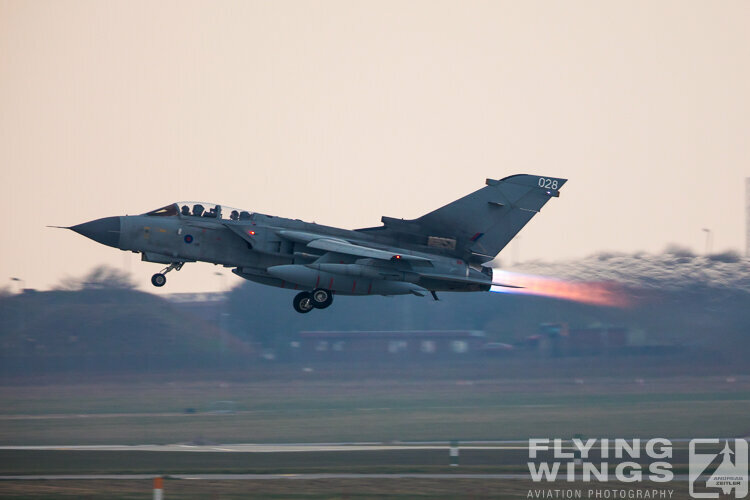 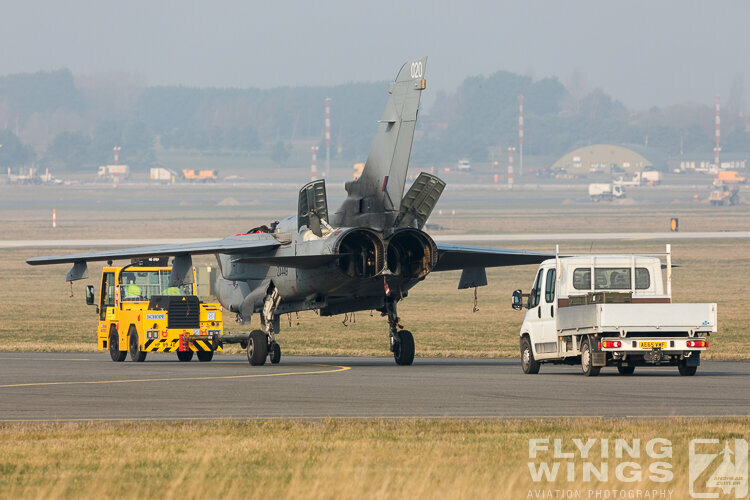 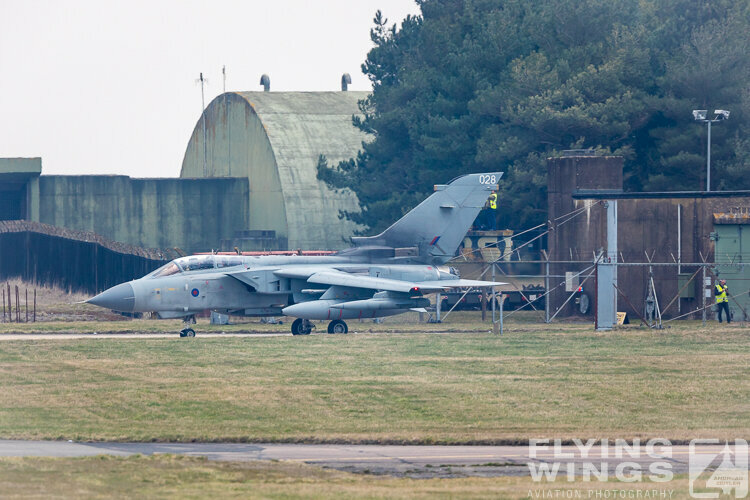 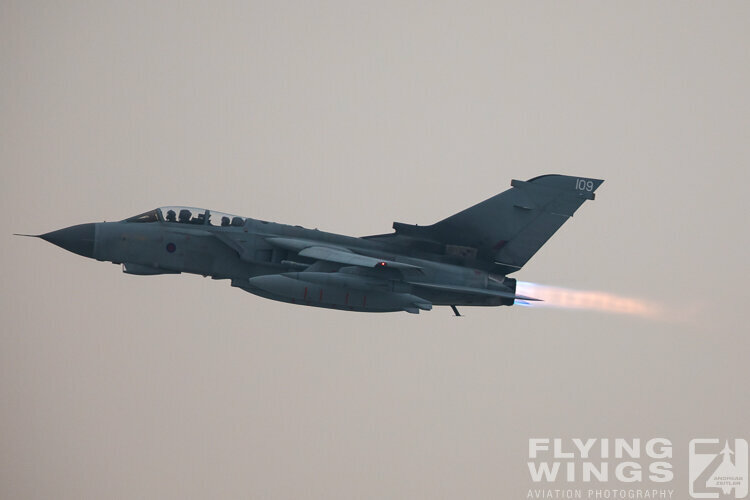 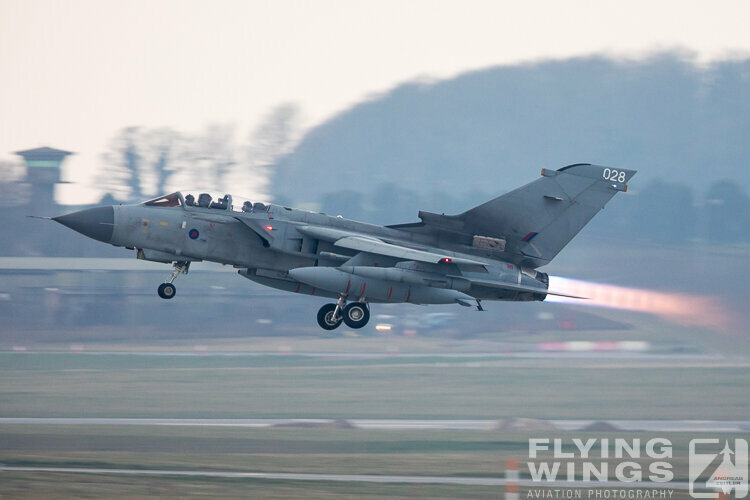 They did three passes, most of the time passing closely to Marham‘s aircraft shelters area that have been their home for decades and where the ground crews were standing and also bidding farewell to their jets. 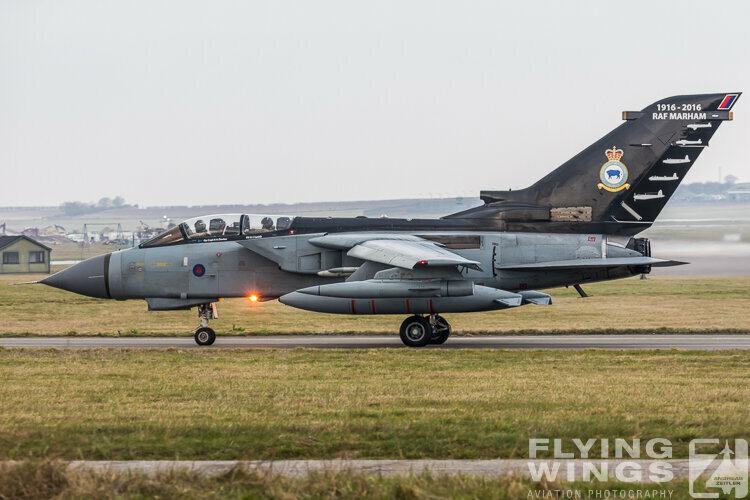 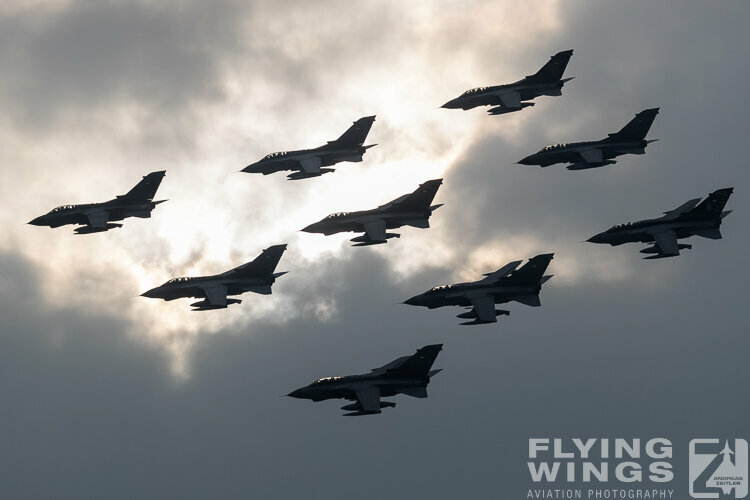 The Tornado formation then split up and a five-ship returned doing the ‚missing man‘ to honor lost crews and bid a final farewell to the Tornado in RAF service. 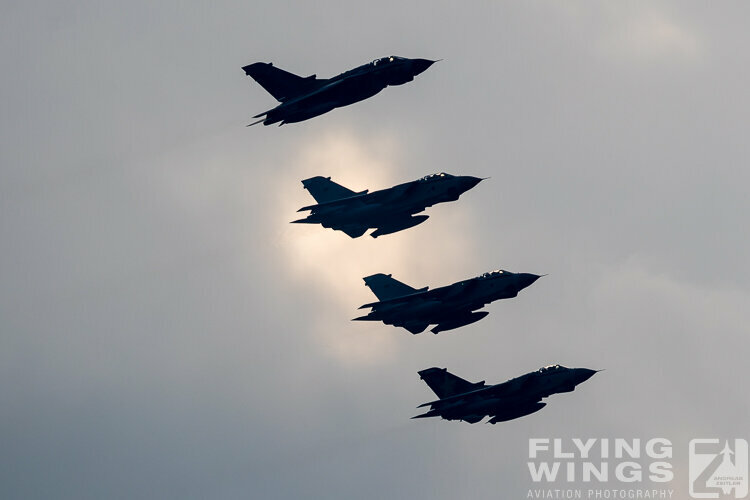 Following these passes the aircraft came into the landing pattern one after the other. 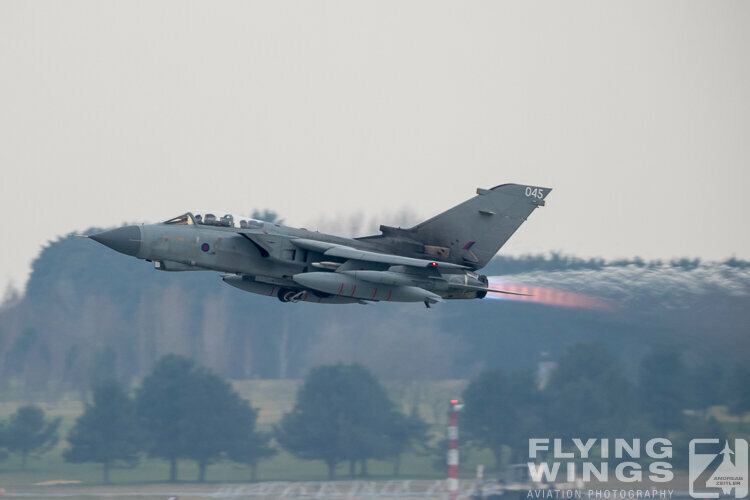 Some jets did not land at once, but took the chance to perform several passes over the airfield. 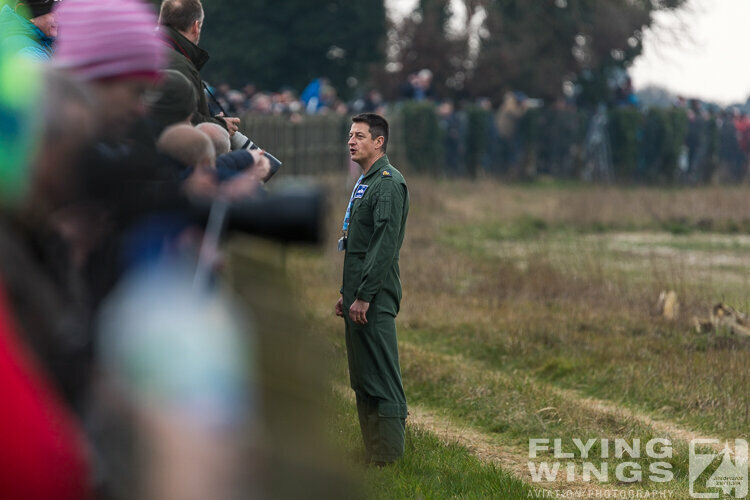 Most likely those have been either last flights of the aircrew, that airframe, or even both. 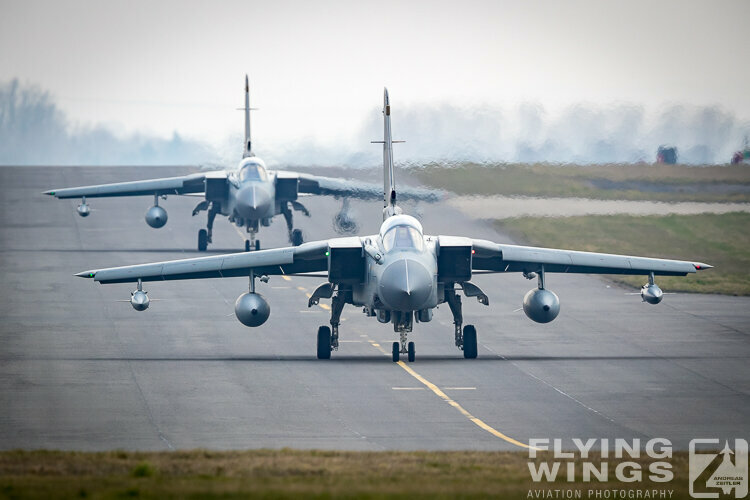 It was already 4pm by then, and I had to get my flight back to Germany. 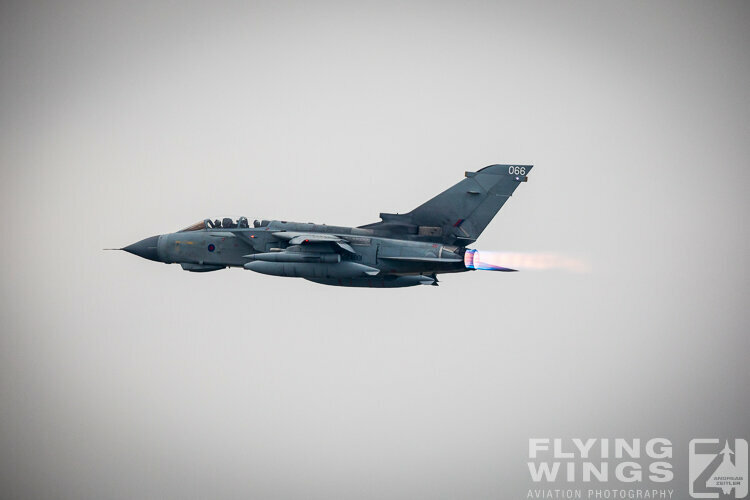 So I did miss the Tornados passing by the photographers for a final time. 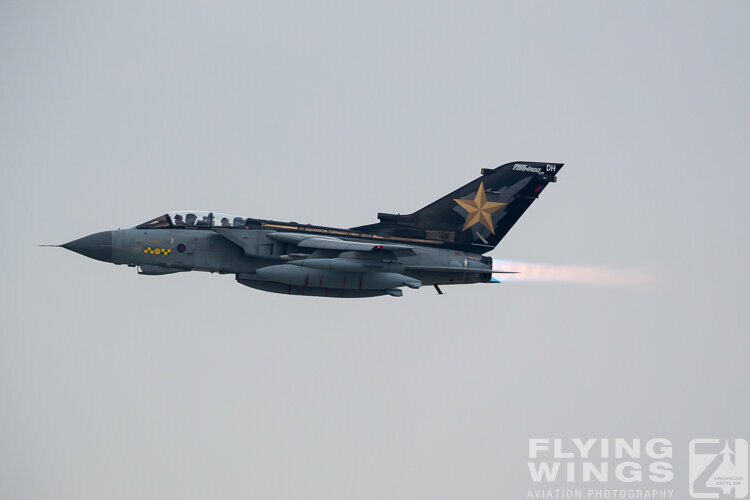 But the hopes for good photos were gone by that time anyhow, and still seeing some of the Tornados in the cloudy sky over Marham while driving back to the airport was somehow fitting for this event. 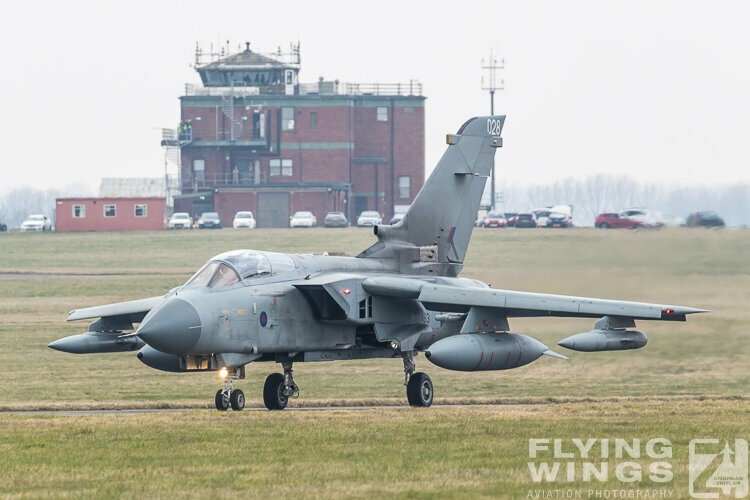 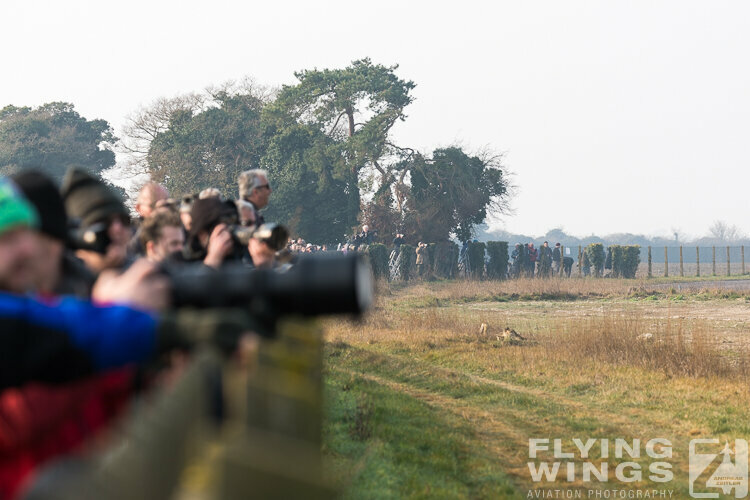 Thanks to RAF Marham, their public affairs and the local spotting community for giving us enthusiasts such a fine opportunity to pay a final tribute to the Panavia Tornado!